Thinking about this, I believe there are two primary reasons. One is the real issue that on any given day, roughly two thirds of the people reading this blog have never been here before. (Hi, all of you, and welcome!) That is a typical percentage, I understand – some will like what they see enough to subscribe or otherwise become regular readers, many will like it enough to return every so often or if they’re looking for something they think I’ll write about, some will just move on to another site that better fits what they need and want – and that is normal. But it gives me a certain incentive to produce stand alone recipes. I’ve had a running debate with a friend about Real Cooking. 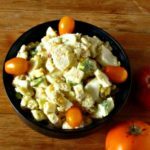 She insists that she Doesn’t Cook – meaning that she doesn’t pore over recipes, she doesn’t fuss over ingredients, she comes home from a long day at work and just gets that meal on the table. But in fact (and particularly when her kid was young) she had the chicken in the slow cooker, the casserole in the microwave (many casseroles just need to be heated, a microwave is fine, especially when that’s what lets you do it!) She served vegetables. She even made the occasional weekend pancakes! (So, from a mix, who cares? Sometimes you need to do what works.) That’s all cooking. Some of it was from a box, but not the drive-through… She cooks. A week ago I wrote about cooking leeks and chicken – and while I walked you through the options of either fresh leeks or frozen, I wrote the actual recipe assuming fresh. But from here on, I will write more recipes for the pre-cooked or pre-prepared food. After all, maybe you don’t have my green muffins, but you do have a bag of frozen spinach (and have been wondering when to add that without overcooking.) Maybe you have frozen slow-cooked chicken, or the rest of a rotisserie chicken, and are wondering what to do with it now, other than a few recipes for soup or chicken salad. 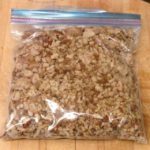 I’ve been writing bean recipes assuming that people might use canned beans – I just need to extend the concept to all the other foods I use already prepared. Anyway, I’d actually planned this post, using cooked meat, before I thought about all that. It’s the day after a holiday, which means that more people than usual have leftover cooked meat on hand, and many of them are wondering what to do with it! 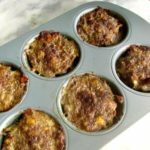 Ham is common, and I’ve written several recipes for cooked ham before, from Confetti Ham Casserole to Split Pea Soup with Ham. 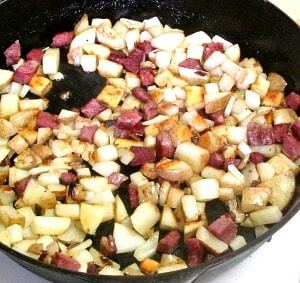 I decided this time, though, to make a fairly simple hash, which can be made with ham, roast beef, or the corned beef I used (since I made it last week.) Whether your meat was roasted or a pot roast, or even pan broiled, it’s a great way to make a meal of the last odds and ends. And indeed, this is one of those Not A Recipe recipes – you can vary both ingredients and proportions depending on what you have on hand. It’s really more about technique. But I’ll give you the actual measurements I used to make a meal for the two of us. Meanwhile, scrub two medium potatoes and cut them in small dice. If you have some already cooked, great – that’s very traditional, and cooks faster. If you don’t – I didn’t – it just takes a bit more time… Put the cut potatoes in the pan, raise the heat a little, cook until brown on one side. Meanwhile, cut up the meat and a small onion (or half a larger one…) Once the potatoes are brown, stir, and add the meat and onion – continue cooking until the potatoes and onion are both cooked through. 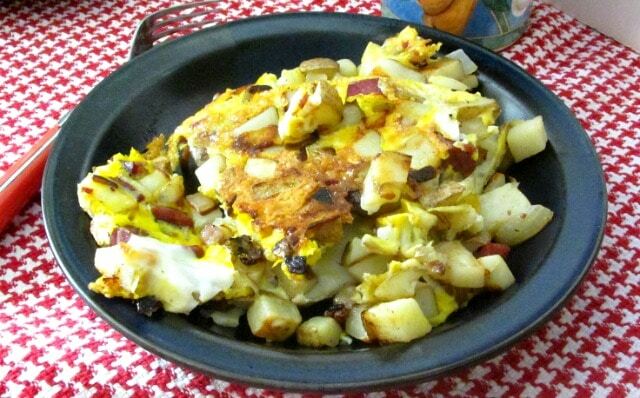 Now this piece of meat was not large enough by itself for a meal for two – and eggs are a classic with all kinds of hash.One method it to fry them and place them on top, another is to make nests in the hash, drop in the eggs, cover the pan, and steam them. I decided here to beat the eggs, pour them over, and cook it all like a frittata, though I just covered the pan to complete cooking, instead of popping it under a broiler. Once the egg was cooked, I cut it in quarters for convenient service, and we enjoyed it for lunch! 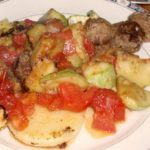 If you render out the fat from the meat, and cook raw potatoes this will take a while – if you just use oil and cooked potatoes, you can do it in about ten minutes… but either way it’s still easy, and quite tasty. Great use for the last of any cold roast, and a good technique to know. Use the last of the roast (ham, beef, whatever) to make hash, then stretch it with eggs - a classic and delicious way to use leftover meat. 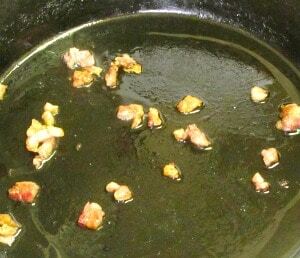 If there is not enough fat, or you do not wish to use it, heat oil in pan. Put potatoes, cut into small dice, in pan in an even layer, over medium heat. Cook until potatoes are brown on one side. Stir potatoes, add onion, stir to coat with fat, add meat. Continue to cook until potato and onion are cooked through. Beat eggs in a bowl. 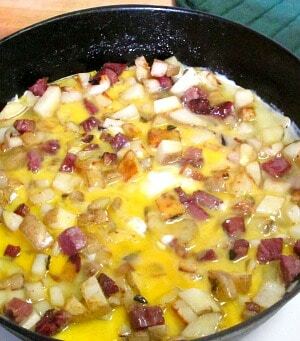 Spread the meat and potatoes in the pan out evenly, pout the eggs over it. Cover pan, cook until eggs are done. 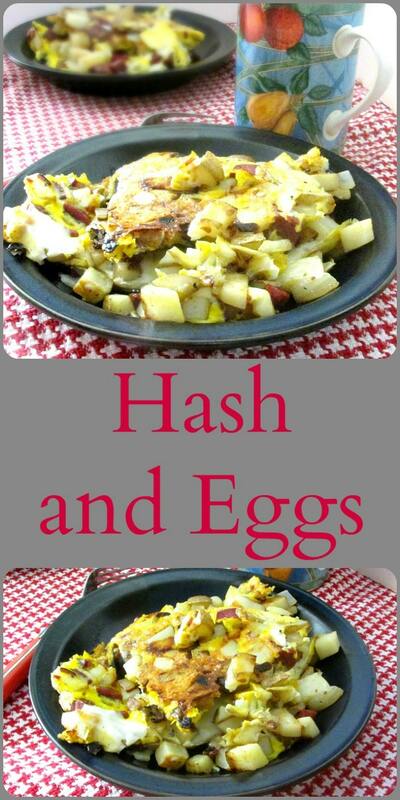 I love a good classic hash and eggs!! Thanks for sharing! Oh, so do I! Thanks! 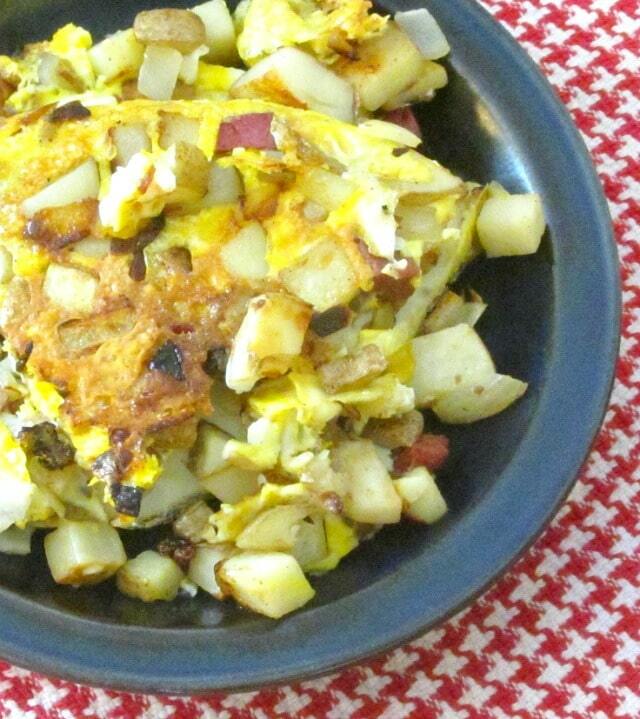 Great way to use up leftovers of whatever is in the refrigerator. Meals like this can be eaten for breakfast, lunch or dinner! It really is - and everyone needs a handful of those recipes! Thanks! Yum! This is my kind of breakfast (or lunch or even dinner!). Mine, too! We actually did have it for lunch... Versatile dish. 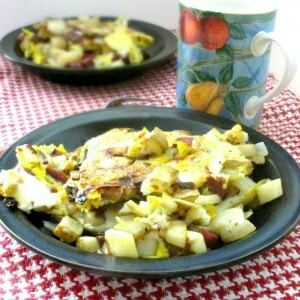 I love potatoes for breakfast! I usually load mine up with veggies. Great way to use up leftovers! Such a great meal this, it is one of our favourites but usually serve it with a fried egg rather than adding in beaten egg, gotta give that a go. I do that, too - in fact, that's how I did it for years! I don't even remember why I did it this way the first time (so I wouldn't use a second fry pan? ;-) ) - but we like it, and sometimes it's just nice to change something up.